Implementation of the base asset storage system. Definition at line 56 of file llassetstorage.cpp. 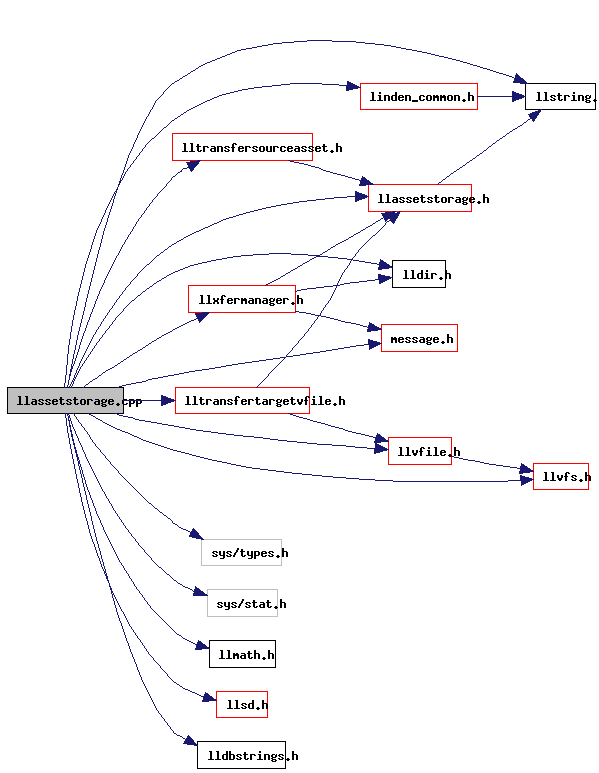 Referenced by LLGestureManager::activateGestureWithAsset(), LLAudioDecodeMgr::addDecodeRequest(), cleanup_app(), LLFloaterCompileQueue::compile(), LLTransferTargetVFile::completionCallback(), LLHTTPAssetRequest::curlCompressedUploadCallback(), LLHTTPAssetStorage::curlDownCallback(), LLHTTPAssetStorage::curlUpCallback(), LLTransferTargetVFile::dataCallback(), LLTransferSourceAsset::dataCallback(), LLAssetStorage::downloadCompleteCallback(), LLAssetStorage::downloadEstateAssetCompleteCallback(), LLAssetStorage::downloadInvItemCompleteCallback(), LLWearableList::getAsset(), LLLandmarkList::getAsset(), LLFloaterCompileQueue::handleInventory(), idle_network(), idle_shutdown(), idle_startup(), LLTransferSourceAsset::initTransfer(), LLAudioData::LLAudioData(), LLLiveLSLEditor::loadAsset(), LLPreviewLSL::loadAsset(), LLPreviewNotecard::loadAsset(), LLPreviewGesture::loadAsset(), LLPanelEstateCovenant::loadInvItem(), LLFloaterAuction::onClickOK(), LLKeyframeMotion::onInitialize(), LLHTTPAssetRequest::prepareCompressedUpload(), process_agent_movement_complete(), process_covenant_reply(), LLMessageSystem::processAcks(), LLWearableList::processGetAssetReply(), LLTexLayerSetBuffer::readBackAndUpload(), LLGestureManager::replaceGesture(), LLTransferSourceAsset::responderCallback(), LLLiveLSLEditor::saveIfNeeded(), LLPreviewLSL::saveIfNeeded(), LLPreviewNotecard::saveIfNeeded(), LLPreviewGesture::saveIfNeeded(), LLWearable::saveNewAsset(), LLFloaterPostcard::sendPostcard(), LLAudioEngine::startNextTransfer(), upload_new_resource(), LLLiveLSLEditor::uploadAssetLegacy(), LLPreviewLSL::uploadAssetLegacy(), LLAssetStorage::uploadCompleteCallback(), and LLFloaterReporter::uploadImage().